If you want a special dessert, here it is! 2. Position a rack in the center of the oven and heat the oven to 325°F. Coat a 13×18-inch rimmed baking sheet with cooking spray. 3. Put the chocolate and cocoa in a medium heatproof bowl, add the boiling water, and whisk to combine and melt the chocolate. Set aside to cool slightly. In a small bowl, combine the flour, baking soda, and salt. 4. Beat the sugar and butter in a stand mixer fitted with the paddle attachment on medium speed until light and fluffy, 3 to 5 minutes, stopping to scrape the bowl halfway through. Add the eggs one at a time, beating well after each addition. Slowly add the buttermilk and vanilla—the batter will look curdled at this point. Reduce the mixer speed to low. Alternate adding the flour mixture (in 3 additions) with the chocolate mixture (in 2 additions), ending with the flour mixture. Scrape the batter into the prepared pan and tap the pan on the counter to level the batter. 7. Turn the cake out onto a cutting board. Use a 3-1/8″ round cutter to cut 10 circles from the chocolate cake. Reserve the remaining cake for another use. 8. Set two silicone bombe molds that hold 6 bombes each (3-1/4″ diameter and 1/2 cup capacity) on a 13×18-inch rimmed baking sheet. 9. 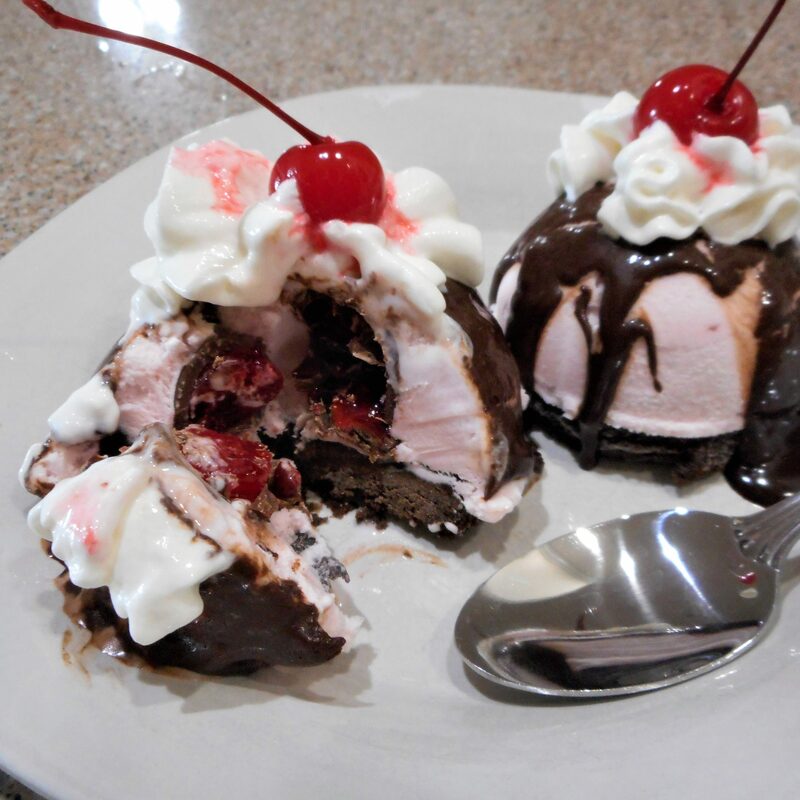 Fill each bombe mold with about 1/3 cup of ice cream, then push a cherry into the center. Smooth the top of the molds and gently push a cake round into the top. 10. Cover the bombes with plastic wrap and freeze until firm, several hours. 11. When ready to serve, invert each bombe onto a serving plate and top with warm, but not hot, Hot Fudge Sauce. If desired, garnish with a dollop of whipped cream and a cherry.